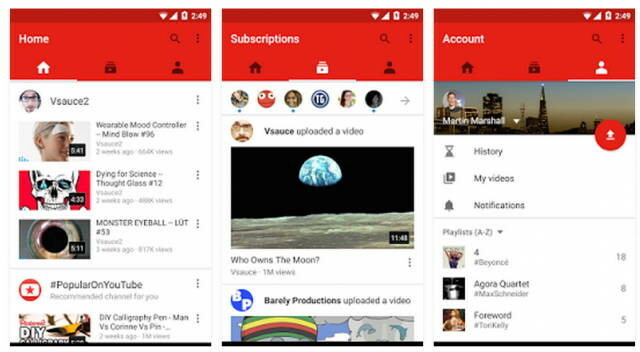 Google is rolling out Youtube redesigned Home interface for the Android and iOS. The new design is cleaner, simpler and takes advantage of deep neural networks to better recommend videos for users to watch. The Youtube redesigned Home interface tab might not look new to some users. But YouTube has been testing the design for a while now. Home features large, high-resolution thumbnails and icons that highlight the creator for each video. The new thumbnails also pop up for a few second when opening a clip in order to give the video a chance to buffer in the background. Youtube redesigned Home interface now lets users record video right from the YouTube app instead of only being able to upload a previously recorded clip. Youtube now surface contents from your Subscriptions. According to YouTube, those who already have the new interface spend more time watching fresh videos and subscribed to content. Recommendations work in 76 languages and YouTube notes that it already recommend hundreds of millions of different videos from the Home tab every day. Youtube redesigned Home interface in now rolling out to Android and iOS users.